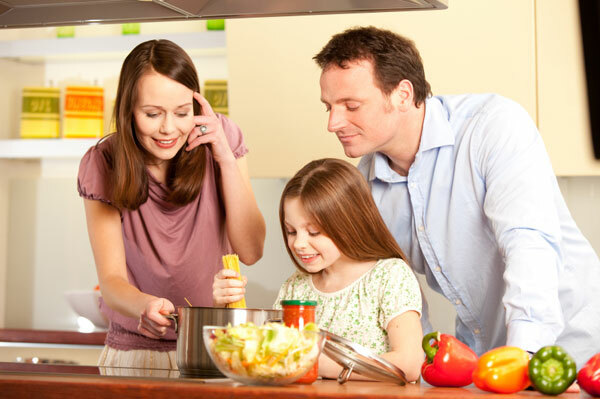 Healthy cooking doesn’t mean forsaking flavor or saying goodbye to satisfying meals. Sensible substitutions for high-calorie ingredients in your favorite family recipes can seamlessly shave fat and calories without sacrificing taste or texture. By making healthy changes to your diet, not only will you be improving your family’s diet, but you’ll be reducing your family’s risk of obesity and chronic illnesses, including diabetes, heart disease and even cancer. Here are some savvy substitutions from The Mayo Clinic Diet: Eat Well, Enjoy Life, Lose Weight by Dr. Donald Hensrud and the weight-loss experts at Mayo Clinic (Amazon, $18). Many recipes call for butter, margarine, shortening, oil or mayonnaise. To help you reduce your family’s intake of fat and calories, try these healthy substitutions. For sandwiches, substitute tomato slices, ketchup or mustard. For stove-top cooking, saute food in broth or small amounts of healthy oil like olive, canola or peanut oil, or use nonstick spray. In marinades, substitute diluted fruit juice, wine or balsamic vinegar. In cakes or bars, replace half the fat or oil with the same amount of applesauce, prune puree, yogurt or commercial fat substitute. To avoid dense, soggy or flat baked goods, don’t substitute oil for butter or shortening, and avoid substituting diet, whipped or tub-style margarine for regular margarine. Diets low in red meat and saturated fat have been linked to longevity and heart health. You don’t necessarily have to forgo a good steak or burger — simply choose leaner meats and limit your portion sizes. Dr. Hensrud recommends replacing most of the meat in chili or stir-fry with beans or vegetables, and if eating meat as an entree, keep your portion to no more than the size of a deck of cards (meaning 3-4 ounces). If you’re worried that you’ll still be hungry, load up on vegetables. Consider this: One cup of whole milk has 160 calories and 8 grams of fat while 1 cup of skim milk has about 100 calories and less than 1 gram of fat. When recipes call for milk, substitute an equal amount of skim milk, 1 percent milk or evaporated skim milk. For example, use low-fat milk in pancake, waffle and French toast recipes and swap out whole milk for evaporated skim milk in mashed potatoes. Evaporated milk is also a great substitute for half-and-half or cream. For most recipes, including omelets or scrambles and baked goods, you can seamlessly substitute 1/4 cup of egg substitute or two egg whites for every whole egg. Dr. Hensrud recommends swapping out regular sour cream and cream cheese with fat-free, low-fat or light varieties when making dips, spreads, salad dressing and toppings. For most baked-goods recipes, you can reduce the amount of sugar by half without affecting texture or taste. However, to maintain moistness, use no less than 1/4 cup of sugar for every cup of flour. To bring out the sweetness in baked goods, use a bit more vanilla, cinnamon or nutmeg. When a recipe calls for all-purpose flour, replace half or more of it with whole-wheat pastry flour or a whole-grain flour. Fresh or dried herbs and spices can add flavor without adding extra sodium to your family’s meals. Dr. Hensrud suggests adding them toward the end of cooking, starting sparingly and then adding more if needed. For cookies and bars, reduce the amount of salt by half. Omit salt when boiling pasta, rice or potatoes. What healthy ingredient substitutions do you use in your kitchen? Let us know in the comments section below. For more information on the Mayo Clinic Diet, visit www.MayoClinic.com.